The primary goal of this project was to build a low-cost and low-maintenance handicap accessible garden for people with limited mobility. 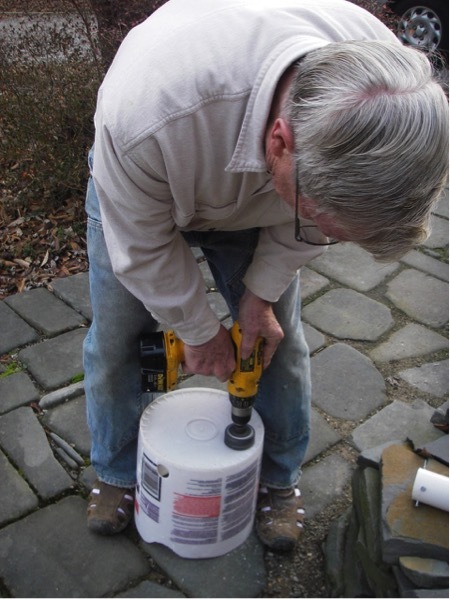 The basic building unit for this garden is the 55-gallon drum used widely throughout the United States for soaps and detergents. These barrels are available free at most car wash places across the nation. In order to provide water storage in each of the units, I am using 5-gallon drywall buckets and food containers. All of the barrels for this project were donated by one car wash along US Rt. 1 and all drywall buckets came from one drywall crew that was finishing a house in my neighborhood. The basic unit consists of a 55-gallon drum cut in half and notched to open out into identically-cut barrels that have been bolted together. A water reservoir has been created in this barrel by cutting the tops off of three drywall buckets. Holes were drilled in the sides of the buckets and the holes were oriented to the center of the barrel. The holes at the center are covered with a piece of plastic covering the merge point so that dirt can not fall in and cover the holes and the buckets may fill and empty depending on the rain/or irrigation. 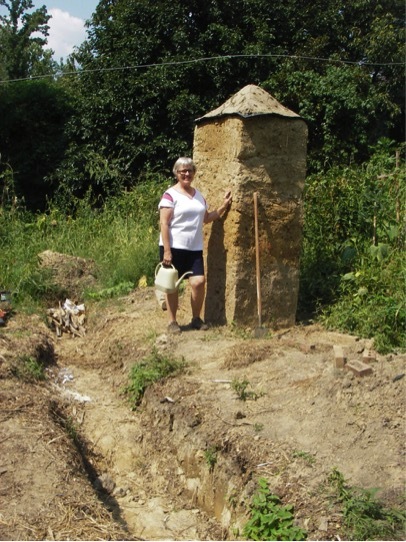 Dorothy wanted me to build an obelisk, but standing in a pit and throwing cobs up to me on a ladder is not her favorite thing to do these days, so I was wondering what sort of project I could do all by myself. 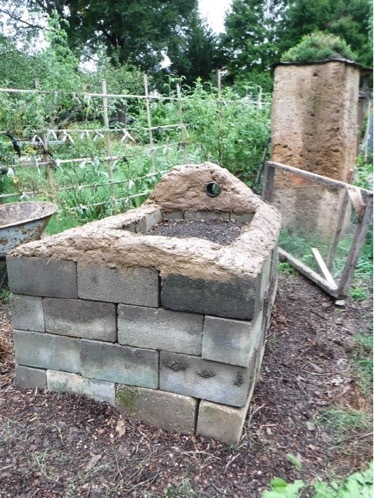 The cob obelisk seems like a good demonstration and just what my garden needs, providing both water and a bee habitat on the upper edge of the garden. I think the size is manageable but challenging. Wet cob weighs about the same as wet cement the way I mix it. That means I will have to mix and move around 6,500 pounds of material to build a 7-foot obelisk with a 30 x 30 inch base. This is by far the lightest and easiest project I have ever done but still big enough to make it interesting. I began this project in October of 2014, quit for the winter, and the bees started moving in the next spring. When designing and building a rainwater-harvesting project, the first thing you need to do is know your land. Here in Virginia we tend to have much of our rain in the winter and early spring, followed by intensely hot and dry summers. Also some of the summer rains tend to be scattered showers. The second week in August, for example, we had a ten-minute "gully washer," a short cloud burst that dumped 1 inch of rain, followed by a light drizzle, and then nothing for weeks before or after the brief rainstorm. Obviously my landscaping should be designed to harvest 100% of that and it did. I turned my water easement into a large water harvesting trench followed by a 25-square-foot pond followed by a berm made of yard waste and wood chips. The pond was totally dry after the rain, meaning that we successfully harvested all of the water from my house and yard and that of my neighbor. That was easy, but what about 4 or 5 inches of rain? Obviously when it does rain we want to catch and hold as much of it as possible where it is most needed. For this reason I built my trench at the top of my garden transverse to the natural slope of the yard. Rain that overflows my rain barrels is directed to the center of the slope and flows straight downhill to the center of the trench. I don't want the captured water sitting around on the surface where it will attract mosquitos and evaporate, so the trench will be filled with biodegradable yard waste and wood chips. 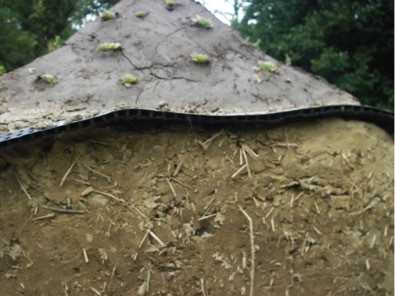 At first a trench dug into heavy clay soil will hold water for a very long time, but as earthworms and insects go to work on the wood chips it becomes a very leaky hole in the ground which will catch and hold much more rainwater than a barrel or other container of equal size. If you have a friend who will throw balls of mud to you while you stand up on a ladder that may be all you need to do this project, but if you plan to work alone you need a good scaffold. I began this obelisk by burying a cedar post as deep as possible with a post hole digger. My thought is that since this is a habitat for bees it will be allowed to deteriorate and fall apart naturally like the Always Becoming exhibit at The National Museum of the American Indian in Washington, D.C. When it falls apart I want it to fall away from the center post in small pieces and not fall to one side in one big heavy piece that could hurt someone. The second step was to dig around the post to the first horizon. That is the point at which the earth changes color indicating that you are below all or most of the top soil. I placed a ring of cinder blocks around the cedar post, placed a 2" x 8" x 24" scrap of wood on top of the cinderblocks and pounded them down into the subsoil with an Ugly Stick, an ugly piece of wood with knots and irregular grain with a chain-saw-made handle just above waist height. The ring of cinderblocks were not quite high enough so I also supported a ring of used bricks on top of the blocks to get my desired height above the ground. My goal, as always, is to get an air space between the earth which may be wet and my lowermost layer of cob which must remain dry. I filled the space around the cedar post and inside the cinderblocks with urbanite scraps and was now ready to begin cobbing. Originally I planned to build a trulli roof in honor of my Italian heritage, but someone gave me a big chunk of living roof fabric so I decided to use that instead and try to create a living roof. 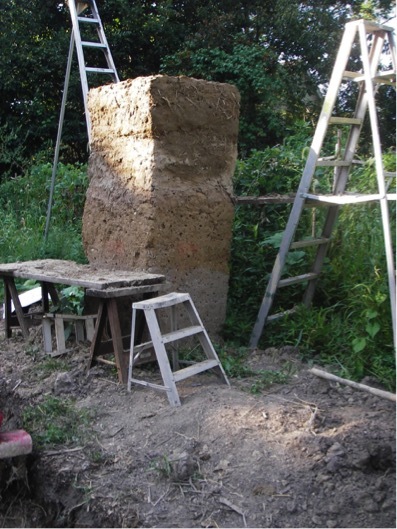 I found that loose dirt could not be stacked up with the proper angle of repose to create a good point on the obelisk, so I mixed two parts clay-rich topsoil with one part compost and one part sand and made this into a cob mix to encase the topsoil and form a pyramid. 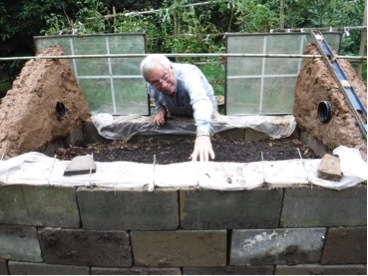 I then took the most invasive and hardy plants from my living roof and poked them into holes in the compost-rich cob. For awhile I will water the plants to see if they can take hold, but if this does not work I may go back to the trulli idea with the slope of the slate tiles reversed to draw water into the core to support plant life. My current project consists of a 48 inch x 79 inch block frame, four courses of blocks with fourteen blocks per course (56 blocks in all). 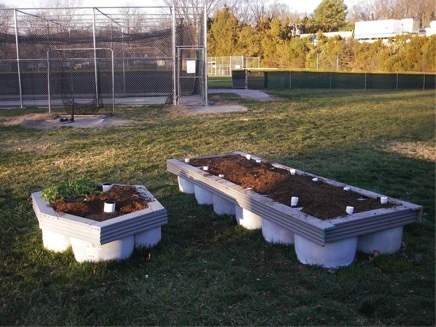 The area inside the lower three courses of blocks was filled with wood chips to reduce the amount of topsoil required to grow plants. 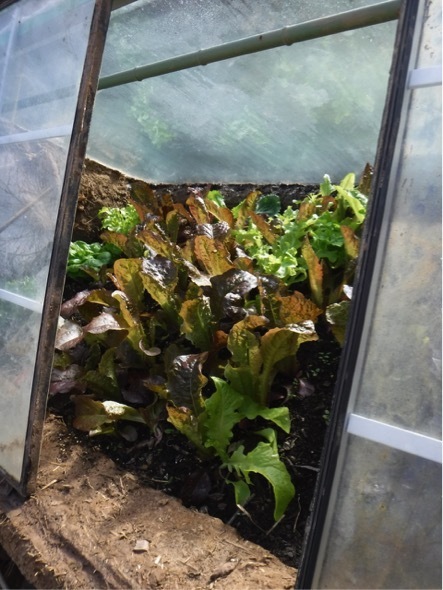 As the chips decompose I will add more layers of top soil at the beginning of each growing season to keep the soil level even with the top of the cold frame. 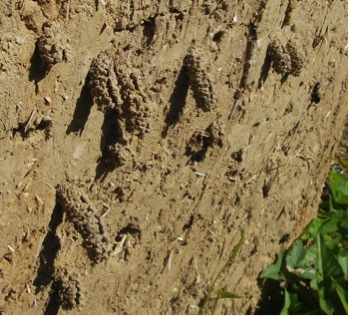 The block cavities are rammed full of wood chips and mud. No cement was used in this project thus reducing the cost and allowing the structure to be disassembled and reused in subsequent projects. I expect this structure to last three or four years with out substantial change or the need for rebuilding. Note the "cobber’s thumb" sticking in the rear-right corner block. 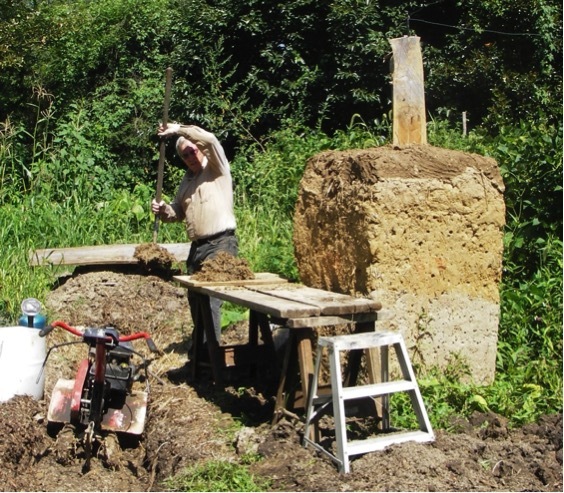 This was used to compact the cob in the courses of block to unify them. This has been an almost unqualified success, but I did not get a chance to try this out on a really cold winter and, of course my basil and sweet potato slips died. So I have started thinking about and collecting materials for a second accessible cold frame to go next to the first one. This one will be solar heated from the bottom. The gold standard of cold frames is being able to grow basil in the winter. In my new cold frame, blocks laid on their side will allow air to flow in or out of the passive solar portion of the cold frame. -Story contributed by Ed. R.
The finished garden next to a less successful design. Scaffold with cobbing pallet and tiller.